This example creates formats for the response variables. The format for the POP variable defines and labels ranges of values. These ranges appear in the legend and make the map easier to understand. The example also uses the AREA statement to patterns the map areas by region. 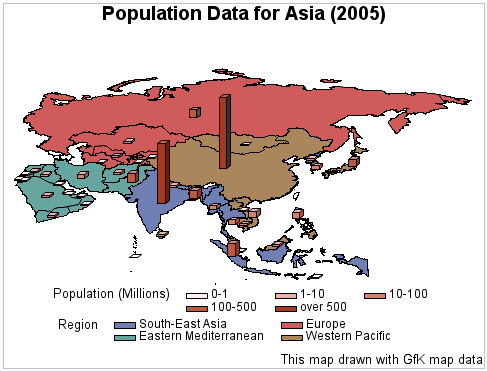 The elongated countries in the output indicate that GfK uses a different projection method than does output created with a traditional Asia map data set. Create a format for the POP variable.POPFMT. defines the ranges of values for POP and labels the values. Create a format for the REGION variable.REGIONFMT. labels the values for REGION. Produce the block map. The ALL argument specifies that the output should include all of the map areas from the map data set, even if the response data set DEMOGRAPHICS does not include an observation for the map area. The output shows 1 such area. The FORMAT statements assign POPFMT. to the POP variable and $REGIONFMT. to the REGION variable. The ID statement assigns the variable ID — which represents the ISOALPHA2 variable after the variable rename when the demographics table was set up. The AREA statement assigns patterns to the map areas according to the values of the REGION variable. The RELZERO option specifies that the blocks values are relative to zero. The LEVELS= option is used to graph all unique ID response variable values.